Salute American is pure red, white and blue from start to finish. 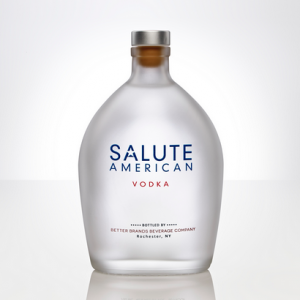 American-made with corn and wheat grains from the heartland, it’s distilled four times for a smooth, clean taste. Salute American is more than a name. It’s our mission. One we carry out by donating $1 of every bottle sold to American Veterans’ Charities. So raise a glass. And join us in helping the heroes who bravely protected the land where this vodka is made. 100% Neutral Spirits and Distilled from grain.